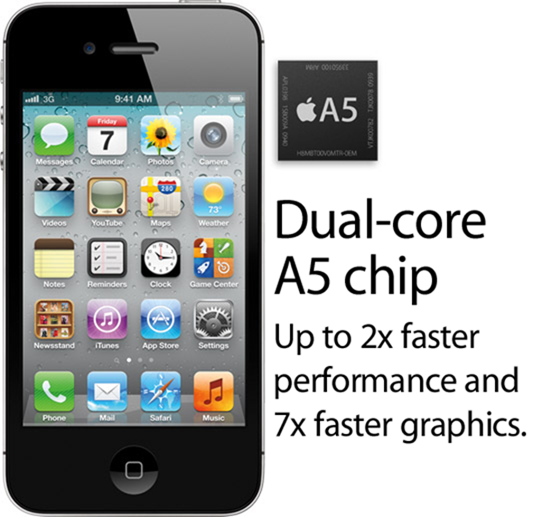 According to benchmark results posted earlier today, the iPhone 4S is the fastest smartphone – both in general and graphical performance – in the world, beating superphones like Samsung Galaxy S II and Motorola Droid Bionic. 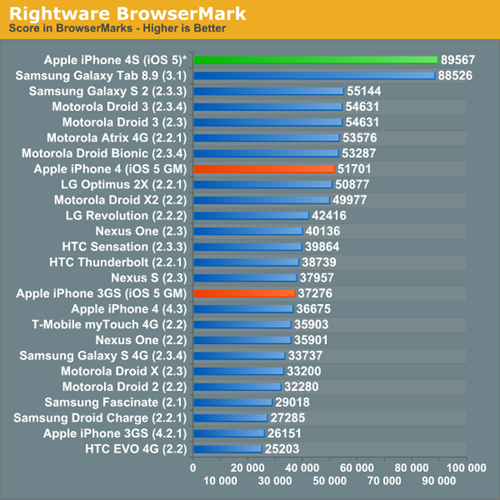 The news comes from AnandTech – an online computer hardware magazine which is known especially for extensive, in-depth reviews – in a post where they discuss different benchmark scores of the iPhone 4S and compare them with competitors from the Android camp. We were expecting to hear news of iPhone 4S standing toe-to-toe with competing smartphones, but as it turns out, Apple’s upcoming smartphone actually beats them by a considerable margin, and this isn’t the biggest surprise! Using the Geekbench for iOS app, it has been revealed that the dual-core Apple A5 chip that powers the iPhone 4S is actually underclocked to 800MHz (compared to 900MHz on iPad 2). 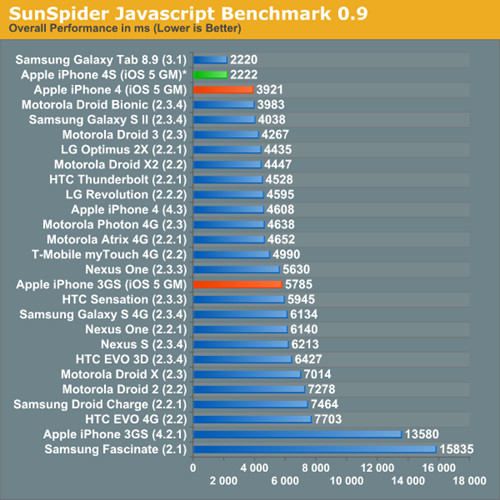 Despite being underclocked and having half the RAM, benchmarks such as SunSpider, BrowserMark and GLBenchmark 2.1 all suggest the same thing: the dual-core A5 chip performs better than the higher-clocked 1.2GHz dual-core Exynos chip and 1GHz dual-core Tegra 2 chips that power the Galaxy S II and Droid Bionic (respectively). This nicely revises the lesson hardware enthusiasts have been preaching over the years: clock speed isn’t the only thing that matters! Apple’s A5 processor is much more optimized and gives more performance per clock. The reason why Apple chose to underclock the A5 chip is pretty obvious: the iPhone 4S packs a smaller battery compared the iPad 2, so a little sacrifice had to be made. Graphics-wise, the iPhone 4S is ahead of the competition too. 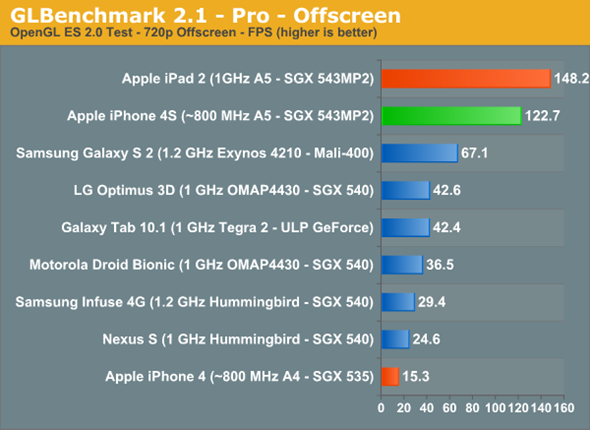 An offscreen 720p render test in GLBenchmark 2.1 reveals that the SGX 543MP2 GPU in the iPhone 4S gives roughly twice the performance of the Mali 400 GPU that comes with Galaxy S II, which previously held the title of the most powerful smartphone GPU. 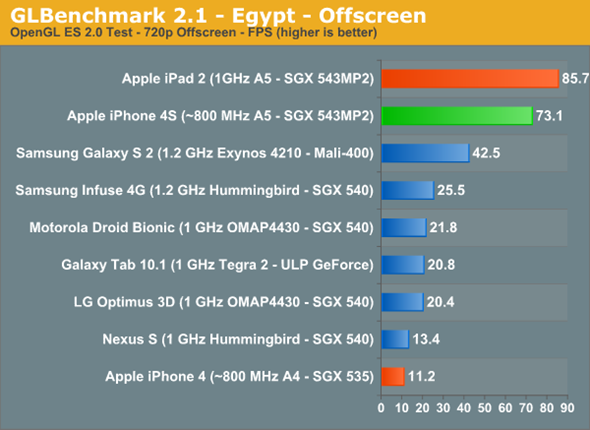 [Graphic’s wise] the iPad 2 holds a ~21% performance advantage, which once again I assume to be all related to clock speed. Also note the huge advantage over the existing iPhone 4. The GPU power in the 4S should be more than enough to run any well written, current generation title at well north of 30 fps on its display. We’ve been covering the iPhone 4S extensively in the past few days. If you wish to learn more, you can read our post on iPhone 4S’ features and specifications. The phone can be pre-ordered as well if you’re interested.